Available to : New clients of FreshForex. End Date : September 17th to November 30th, 2018. 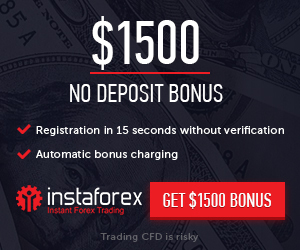 Bonus : $1,000 No-Deposit Bonus from FreshForex. Bonus Trading Period : 7 Days . 1. Register with FreshForex using this link. 2. Open Classic, Market Pro or ECN account for MetaTrader 4 platform . 3. Apply to the promotion and get $1 000 to the account instantly. Withdrawal Terms : bonus funds: not withdrawable profit; received with use of bonus: withdrawable when bonus terms are fulfilled. 1. General terms and conditions apply. 2. The promotion can be changed any time without previous notice. 3. Please ask their support for more information .